The Employees Provident Fund Organization (EPFO) provides EPFO ​​members with the option of taking special advances from the subject matter and the provident fund collection in a select position. Today we will tell you through your article in certain times of circumstances that only a certain part of the PF amount can be extracted. EPFO Members can purchase PF funds for buying or building a home, for a loan payment, not getting salary for 2 months, daughter / son / brother / own marriage, family member's disease etc. Online way to get Provident Fund in Advance-Explain how much amount can be extracted in any situation, either 'special' or 'Advance EPF', today we will also give you information about this. In the event of taking advance, some criteria have been fixed by the EPFO ​​member, they will have to be satisfied. You can apply online for 'PF Withdrawl Form' by going to the EPFO ​​Members Portal for Advance or Partial Withdrawal. The EPFO ​​started the online facility to simplify the process of removing PF funds and saving time. 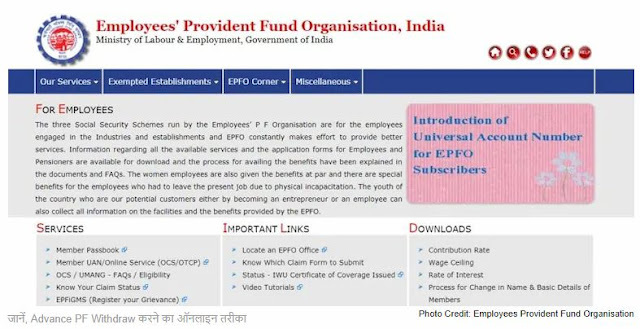 Before applying to the EPFO ​​portal, it is important for you to know that your UAN (Universal Account Number) is activated or your number must be turned on to activate the Universal Account Number. Your account should be linked with Aadhaar, PAN card and back details and IFSC code. First go to EPFO ​​Portal. Then log in to the account by entering UAN (Universal Account Number), Password and CAPTCHA code. After that click on the KYC option in the Manage tab and check whether the base, PAN card and back details are correct and not verified. After verifying the KYC details, go to the online service and select Clam option. Member details, KYC details and service details will appear on the claim screen. After this, click 'Proceed For Online Claim' to submit a claim form. In the Claim Form of 'I Want To Apply For', you will see full EPF settlement, EPF Part Withdrawal (Loan / Advance) or Pension Withdraw Options. Due to the service criteria, you may not be able to withdraw PF or withdraw the pension, in such a situation you will not see this option. EPFO allows its members to extract a maximum of 24 months Basic Wage and DA for buying land. For home / flat / construction, basic 36 days basic wage and DA or interest along with the Employee and Employee Share or the total cost of the house / construction can be withdrawn, whichever is less. The employee, who is an EPFO ​​member for 5 years, can apply for Advance only. PF money can be withdrawn only during the entire period of the job. For advance, the employee will not need any documents other than the release. In the EPFO ​​special case, the member allows a maximum of 36 months of basic wage and with the interest of D and interest, the employee and employer share or the total outstanding amount of loan and interest is also whichever is less. The employee who has been an EPFO ​​member for 10 years can apply for Advance. For the particular withdrawal, the employee will need to get the certificate from the agency, giving details of the outstanding amount and interest. EPFO may also apply for advance advance amount in case the company is closed or withdrawn from the job or if it is not getting salary (in addition to the strike) for 2 months. In such a situation, interest on the Employee Share and the amount can be withdrawn. Employee will need a certificate issued by the employer to take advance. Members can extract a maximum of 50 percent amount with interest. Employee can complete his Basic and DA Amount for a maximum of six months. Employees can withdraw money for themselves or for a member's illness in the family. There is no need for a membership period for this purpose. The EPFO ​​member can withdraw 50 percent (Employee Share) PF Amount with interest for the marriage of himself / daughter / son / sister etc. Note that the employee who has an EPFO ​​member for 7 years can apply for PF account only. 50% (Employee Share) amount can be withdrawn with interest for higher education (for post gaugion) of son or daughter. The employee who has an EPFO ​​member for 7 years can apply for the same pf amount. The certificate related to the course and details of the estimated expenditure by the Institute will be provided. After 54 years of age and one year before retirement, EPFO ​​member can withdraw 90% of the PF in the PF as partial withdrawal.